Telecommunications are increasingly recognized as a key component in the infrastructure of economic development. For many years, there were state-owned monopolies in the telecommunications sector. In transition economies, they were characterized by especially poor performance and high access deficits, as telecommunications were considered to be a non-profit-oriented production process intended to support the socio-economic superstructures. As a result, the starting point for the reform processes in transition countries was quite poor performed public monopolies, functioned under completely different circumstances as the peers in the market economies. The main question of this book is what the strategies for the successful future development of the telecommunications sector in transition countries are. The special focus is on Russia, the largest of the transition countries. 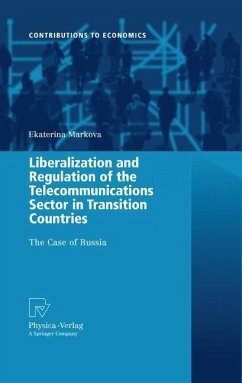 Trends in the Telecommunications Industry Worldwide, and in Russia in Particular.- Theory of Privatization and Liberalization in the Telecommunications Sector.- Theory of Network Regulation and Regulatory Policy Options in the Telecommunications Sector.- Telecommunications Role in the Economic Development and Sector Encouraging Policy Options.- Conclusion.